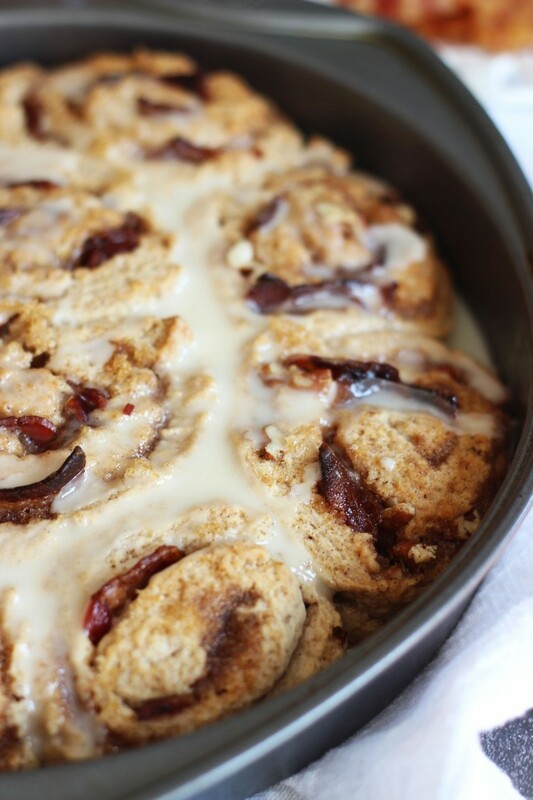 These quick and easy, no-yeast, no-rise, cinnamon rolls with brown sugar, cinnamon, and pecan filling, and maple bacon, are super simple and delicious. 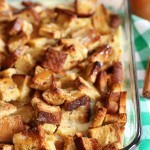 They’re the perfect no-fuss holiday breakfast and brunch treat! I was a bottomless pit on Sunday. I could not.stop.eating. Do you have those days? Sunday is the one day of the week that I *always* take off from exercising, yet without fail, it is the day of the week that I’m most hungry. I rarely do much more than bake and sit on the couch watching football on Sundays, but my appetite is always the most voracious. Funny how that happens. Luckily, these cinnamon rolls came to the rescue. Let them rescue you too! Not necessarily because you’re unusually hungry… just because they’re excellent! I happily snacked away on these, and then all was right with the world. First of all, they have bacon in them. I can go on, but is that necessary? I’ll continue anyway. Stick with me. The bacon is drizzled in maple syrup since that is the way bacon is best enjoyed in life, in my opinion. 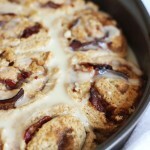 The cinnamon rolls are bursting with pecans and brown sugar, and oozing with butter. Obviously, I will not pretend or claim these are healthy. Would you believe that they’re really not that bad, though? If I had a chance to convince you of that, I probably lost you with the apple cider glaze. It’s all worth it. 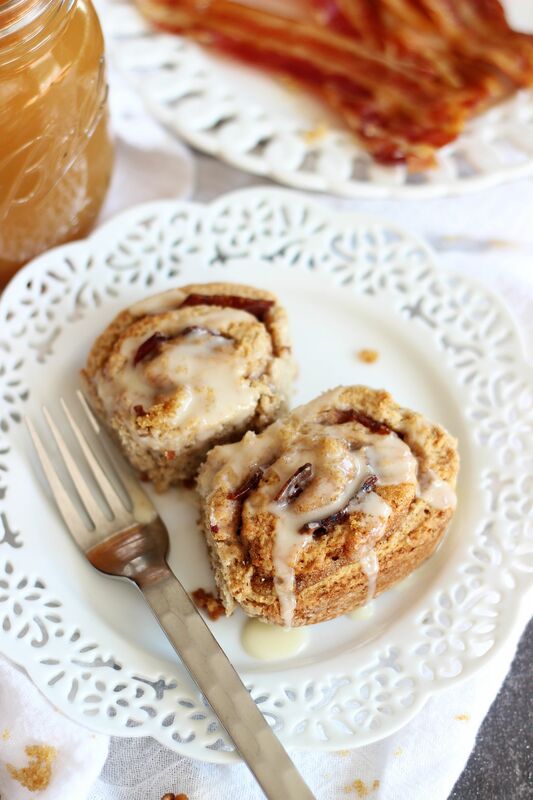 Best of all (okay, not best, but great), these are no-yeast cinnamon rolls! In my years spent on earth so far, yeast and I have yet to get into a groove. It’s probably not the yeast, it’s me. Either way, I’ve learned to appreciate a quick bread. These are unbelievably simple to make since they don’t require yeast, a time investment waiting for the bread to rise, praying it will, but it mysteriously doesn’t. None of that is involved. Mix it up, roll it out, stuff it with a yummy filling, and you’re good-to-go. 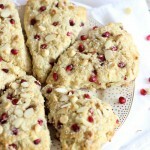 I really think these are perfect for a holiday breakfast too (hint, hint) because they’re truly fast and fuss-free. They’re on the more indulgent side, and if you’re like me, holidays are for splurging. In my family, cinnamon rolls for breakfast on holidays are pretty traditional. Granted, they’re typically from a can, and while I have no issue with that whatsoever, it’s always fun to make things from scratch and add bacon to them. So…. you should totally go and do that! 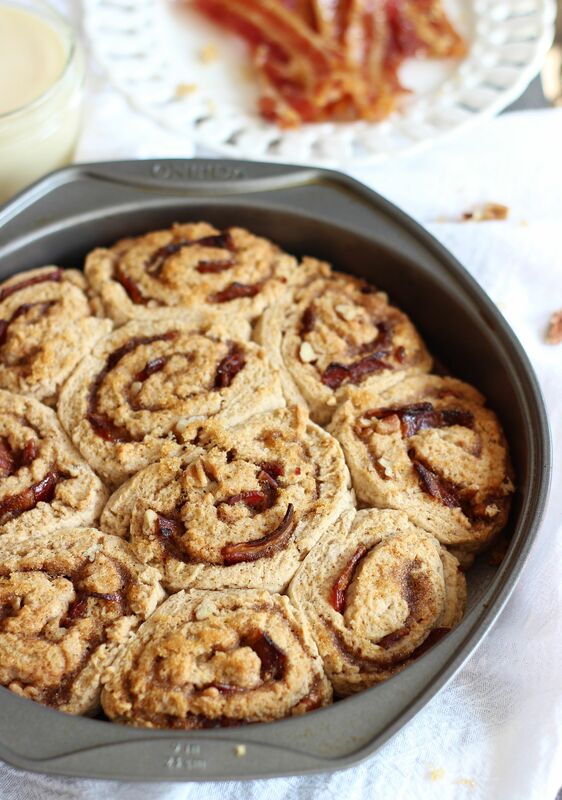 These fast and easy, no-yeast, no-rise, cinnamon rolls with brown sugar and pecan filling, and maple bacon, are super simple and delicious. 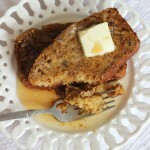 They're the perfect no-fuss holiday breakfast and brunch treat! Drizzle cooked and crumbled bacon with maple syrup. Toss to coat. In a large bowl, combine flour, 1/4 c. brown sugar, and baking powder. Cut in shortening til crumbly. Stir into crumb mixture until just blended. Turn onto a lightly floured surface, and knead 3-4 times. Do not over-knead. With your fingers, carefully spread it into about a 14x12 inch rectangle. Mix together melted butter, remaining 1/4 c. brown sugar, and cinnamon. Spread mixture evenly over the dough. Sprinkle evenly with pecans and bacon. 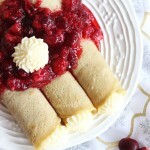 Roll up, jelly-roll style, starting with the shorter side, and cut into 8-10 3/4-inch pieces. Place in a lightly greased round cake pan, clustering them toward the middle (they'll expand to the edges). Bake at 400 degrees for 18-22 minutes, or until golden brown at the edges. Remove from oven and allow to cool on a wire rack for about 10 minutes. Serve warm, with glaze. In a small bowl, combine apple cider and powdered sugar, and whisk vigorously til smooth. Drizzle over hot cinnamon rolls. Happy day before Thanksgiving, friends! I feel like I always overindulge on Sundays, too! 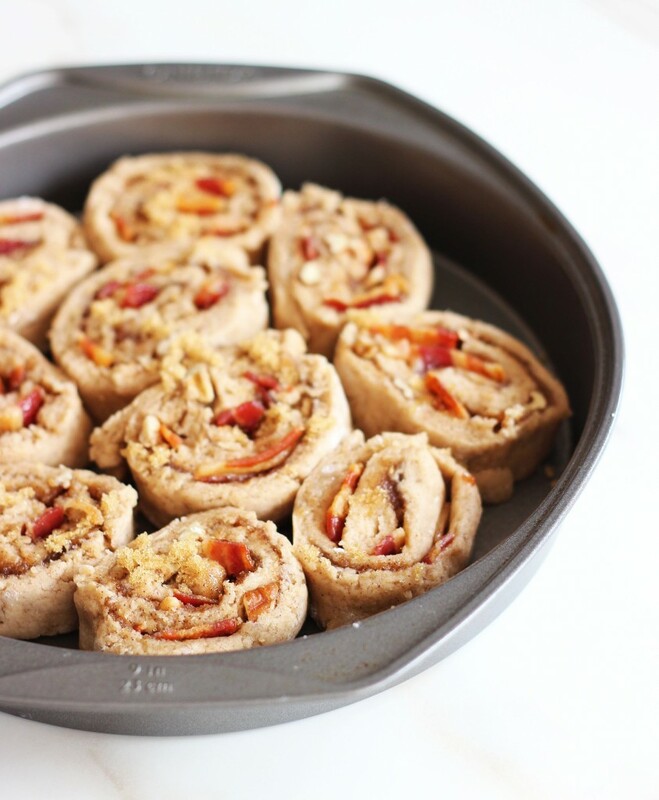 These rolls look so amazing, Sarah! 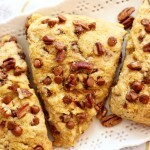 I’m seriously drooling over here..maple, bacon, pecans? Perfection! I absolutely love your creativity. And the fact that they’re no rise makes them even better! Sounds like the perfect breakfast or snack! Have a wonderful Thanksgiving, friend! You don’t like yeast? Gasp! I’ll admit it makes me nervous cooking with yeast when it looks like it won’t rise. 🙂 LOVE maple glazed bacon – I actually smear it on the bacon as it cooks. Drool. Oh I love yeast! I just struggle with it! I know it’s me. I just have never been able to ensure a good rise! So no-yeast things are no-fail for me. Haha! Thanks, Christina! Happy Thanksgiving! Did you say bacon?? Oh my gosh!! I’m not with you on the yeast, I love making yeast breads, but quick breads ARE so much faster, and cinnamon rolls that don’t take a full day to make is kind of exciting! These are so creative, so much stuff in them! They look delicious! You are really good at yeast breads! It not that I don’t love them, but yeast doesn’t love me back. I can’t ever seem to get it right, but I’m going to keep working on it!! Haha! Thanks, Stacey! 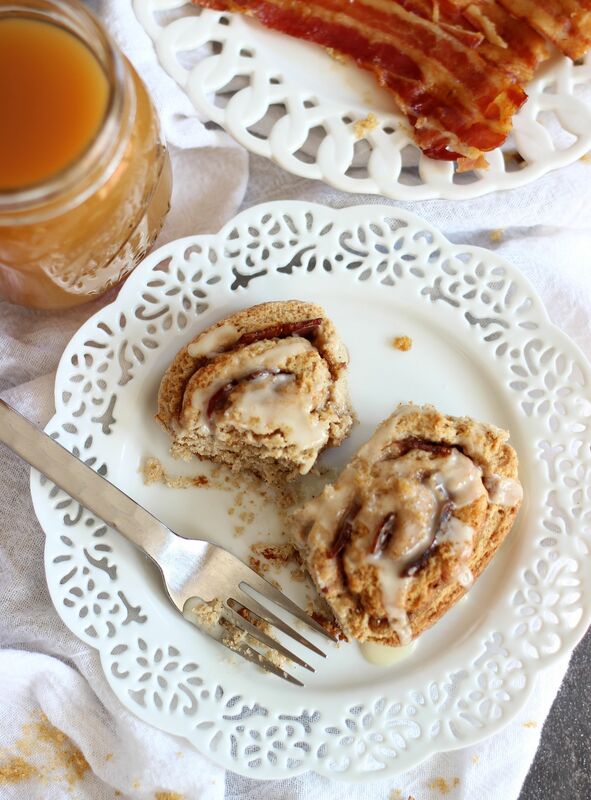 Sundays are our treat days too and these cinnamon rolls wouldn’t last a second at our house. They look amazing and oh my word, did you say bacon? I think my heart just skipped a beat! Pinning! These sound and look totally amazing! Maple bacon?! Hello! These are amazing! 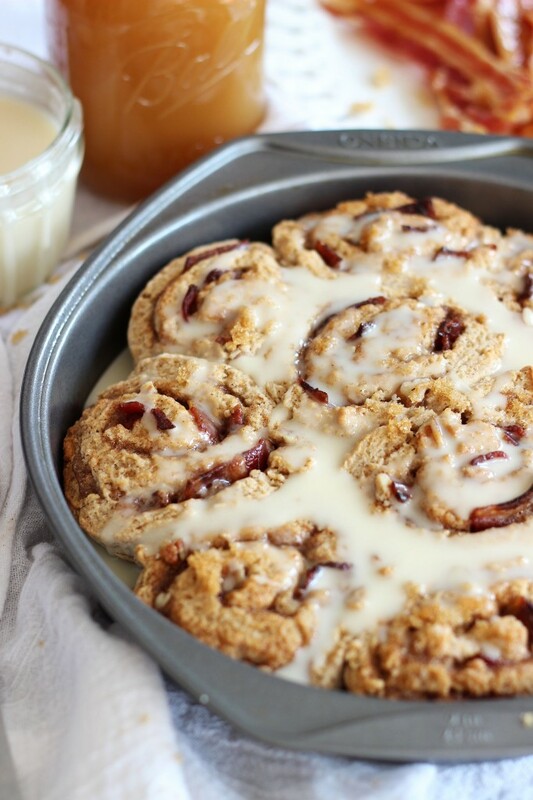 Maple bacon in cinnamon rolls??? YES!!! So I came over from the SU FB group to add your post, and I ended up drooling. Can this recipe get anymore perfect?